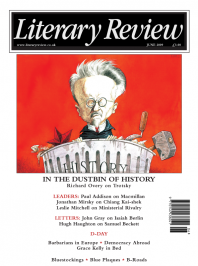 In February 2007, Literary Review published a light-hearted piece by Patrick Hennessey about setting up a reading club while serving with the British army in the southern Iraqi desert. Inspired to turn it into a book, he has produced an engaging mixture of stream of consciousness, war reportage and reflections on the nature of modern warfare, bringing to the story of Sandhurst and tours of duty in the Balkans, Iraq, Afghanistan and the Falklands all the gung-ho, self-mocking, fast-moving style made popular by the new generation of post-Tom Wolfe American writers. Sandhurst, as he saw it, was ‘Hogwarts with guns’; for the rest, it was mostly a question, in the words of his subtitle, of ‘killing time and fighting wars’.